there are versions for Windows, Mac, and Linux. you will notice two Windows versions. One is an installer. This is the easiest way to get going. The best source for info on Chinese HTs is Miklor.com Here you'll find reviews and information. 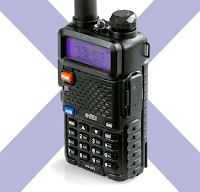 Some of the most useful information here is the comparison of various Baofeng/Pofung radios so you can figure out the differences, and the USB driver troubleshooting guide. The Tri-Band HT I had that looked like a UV-5R but is actually a B-Tech UV-5X3 is a great little radio. Available here: https://goo.gl/cre33a Currently under $60 as of this writing, and available through PRIME next day shipping! While you're looking at the '5X3, take a look at B-TECH's other offerings. They have some interesting radios including the 8-Watt HTs, and some very interesting mobile radios too. I am testing this tri-band antenna with it (It comes with two antennas stock. One for 2M/440 and one for 220): https://goo.gl/mmrR81 Keep in mind that most of these radios use reverse SMA (or MALE SMA) connectors so they require an antenna with a FEMALE SMA. I'll report back on my findings.